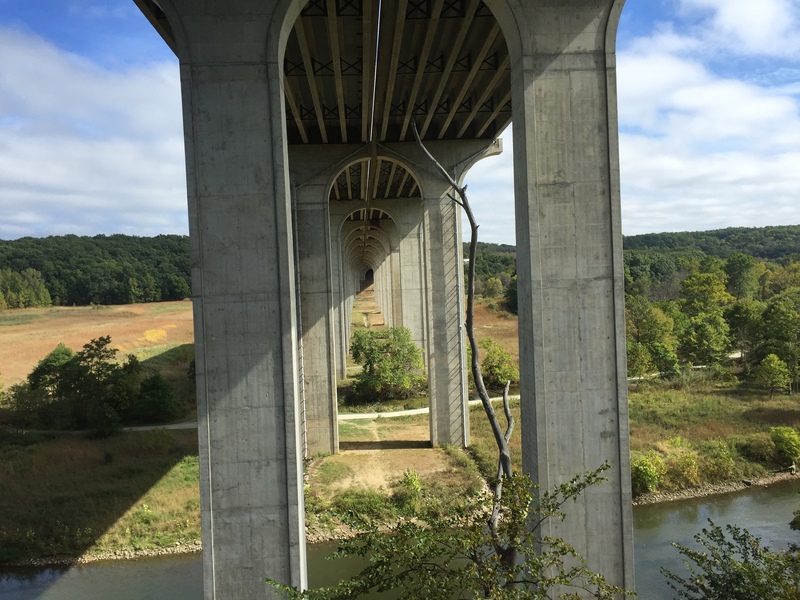 Today was a beautiful day with partly cloudy skies and temperatures approaching 70 degrees. 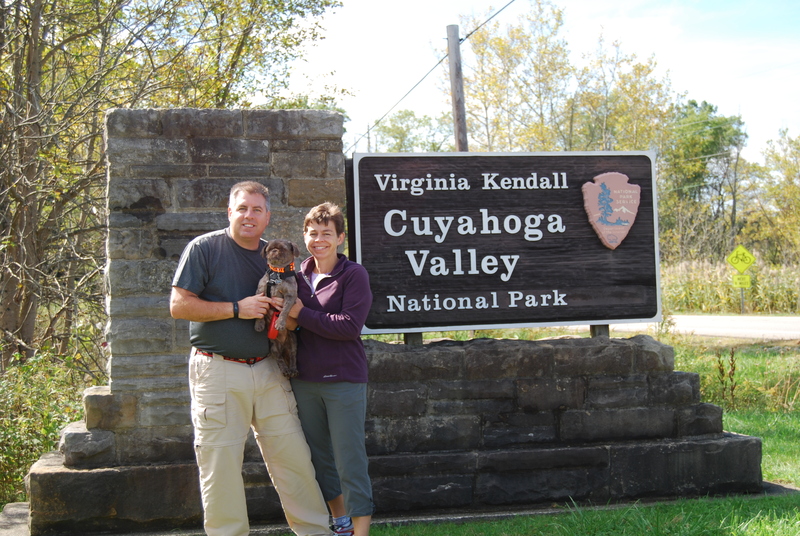 We headed into Cuyahoga Valley National Park in the morning to give us plenty of time to explore. The park was only 15 minutes from our campground and the ride in was through very beautiful towns. The houses were huge with well maintained yards. We arrived at the visitors center in Peninsula just as one of the old steam engines was pulling in. We stocked up on maps and headed out to explore. 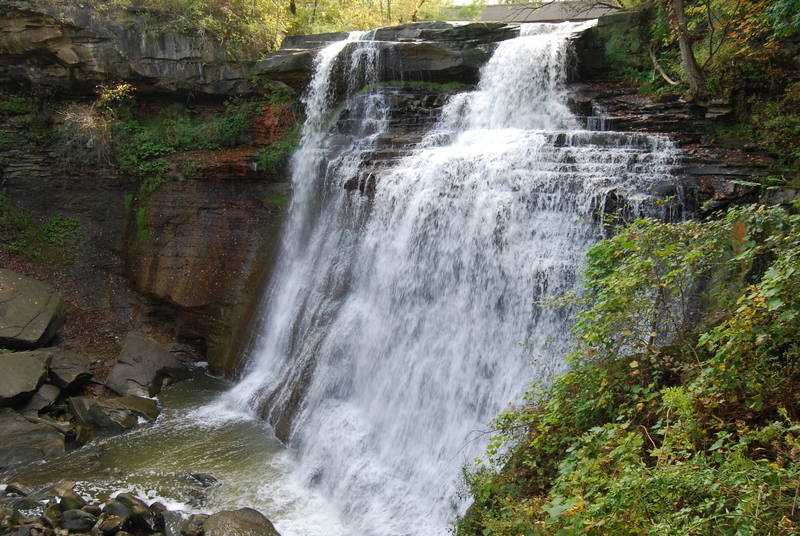 The first stop was at Brandywine falls where we took a loop trail but couldn’t complete it because the bridge was out. The hike turned into a 2 mile out and back. The falls were huge and they were flowing pretty nicely due to all of the rain.The Towpath trail runs right through the park. We had made the tough decision to not take our bikes with us on this trip and we really wish we had. The bikes aboard program is a really good deal for just $3. It is definitely the cheapest way to ride the train. We will plan on bringing our bikes next year and taking advantage of this deal and the great trails. 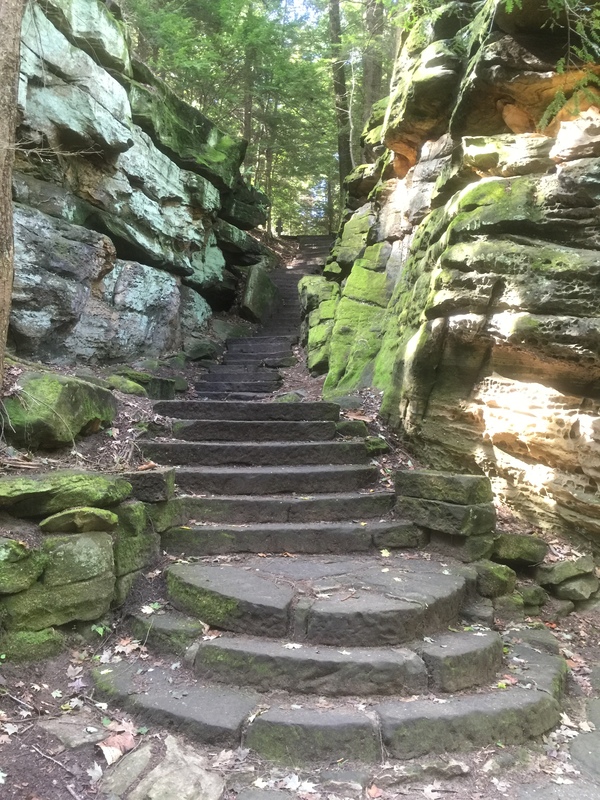 The next destination was the Ledges Trail. 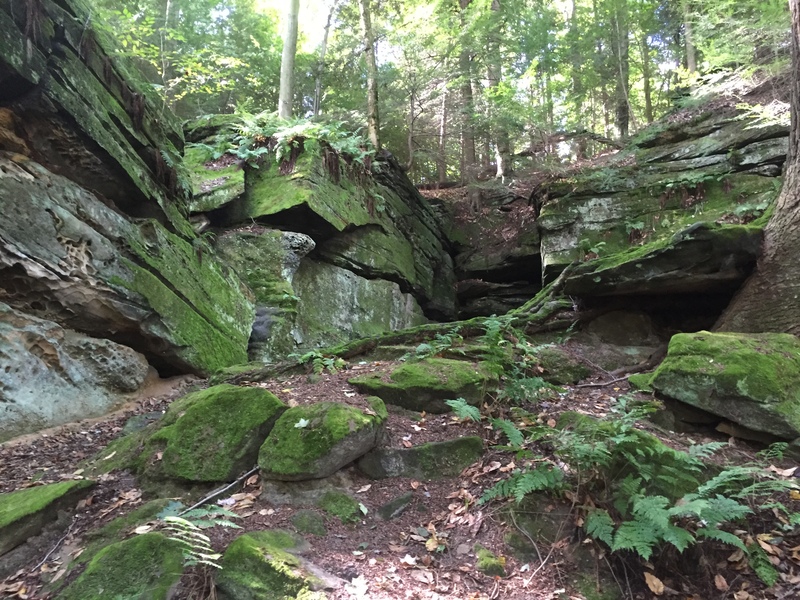 This is a really cool loop hike through ledges and ends with a look out over the valley. 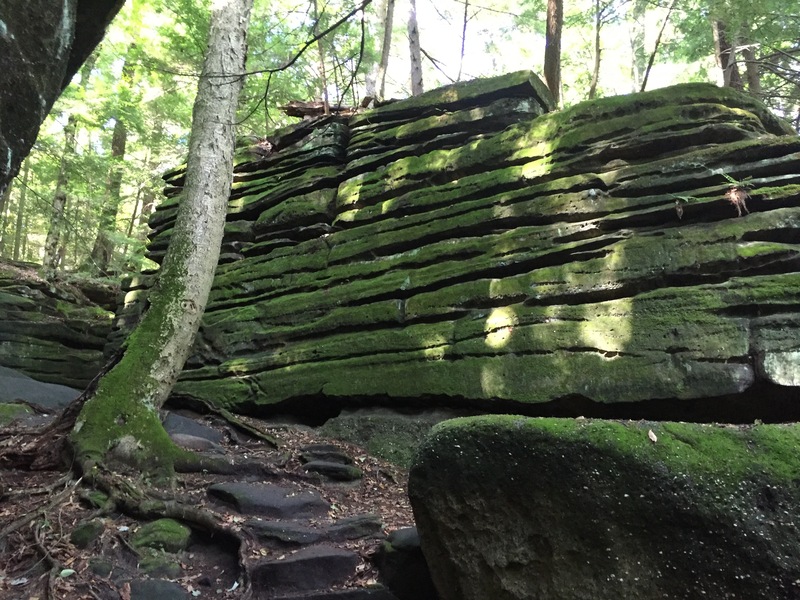 The loop was about 1.8 miles and it was fun to walk through the ledges that were covered with mosses and plants. We headed back to the RV in the early afternoon for some “down time”. We hauled out the lawn chairs and flipped on the outdoor TV and relaxed in shorts and t-shirts watching the Cleveland Indians (we are about 30 minutes from Cleveland) play the Boston Redsox. We took advantage of our full hook-ups and did a few loads of laundry in the RV washer/dryer – love that machine! 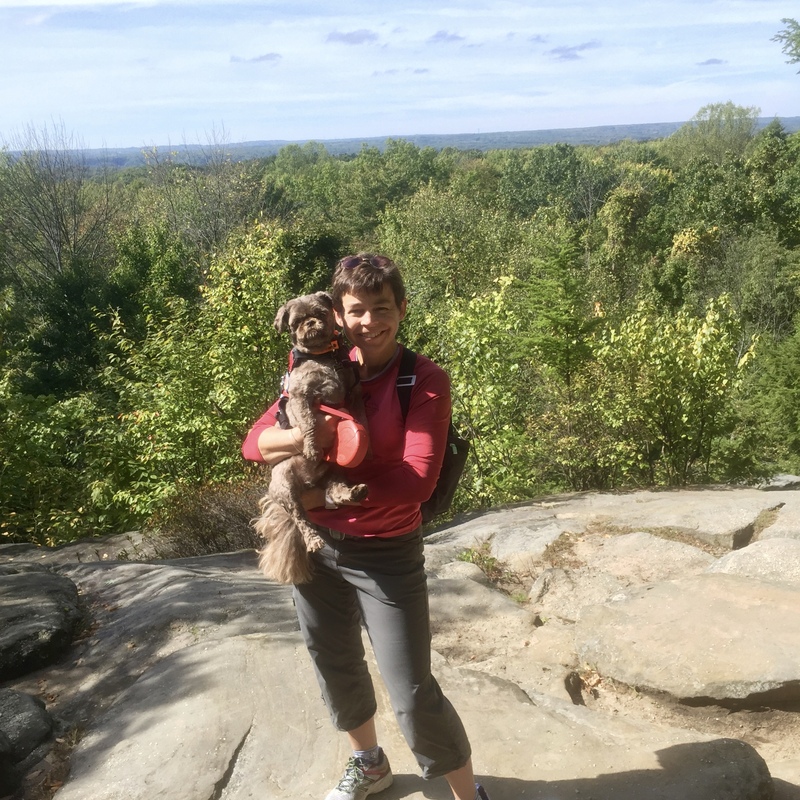 This entry was posted in The journey west and tagged Bikes aboard, Brandywine Falls, Cuyahoga Valley National Park, Ledges trail, splendide. Bookmark the permalink. What a wonderful day. I so appreciate knowing that we, too, can manage in our home away from home someday soon. I love hearing you have washer drier. Congrats!